Sandwell Council, no doubt keen to keep their noses clean after presiding over THE pUBLIC art gallery disaster, have been boasting lately about the fact they’re introducing the “lowest council tax rise in the Black Country”. The “lowest rise” certainly has an oxymoronic ring to it, and – let’s face it – is a pretty lame boast. Nevertheless, with questionable use of the English language, the deputy leader Cllr Steve Eling proudly proclaims that, "We believe this is a people's priorities budget that won't burn a hole in their pockets” in a press release from late last month on the council’s website. But let’s be clear, it’s not a cut and they will be taking more money from residents in Sandwell than they did last year. Though keen to publicise what the money they raise will be spent on (£400,000 for “town teams”, £300,000 on recycling etc) they seem to have neglected to mention just how much will be spent on publicity – or more specifically – posters. Anyone who lives in, around or occasionally circumvents the Sandwell area will be able to verify that this is a council who love their posters. And anyone who regularly uses the buses in and around Birmingham and the Black Country will be much better acquainted with the various delights Sandwell MBC has to offer than those of any other council in the conurbation. A WMTPA supporter took the pictures you see here on just one (short!) journey through the area! And just a brief stretch of the Hagley Road is home to three of the “Great People, Great Place, Great Prospects” posters within just a few hundred yards. So who are they actually appealing to? If you live in Sandwell you have no choice as to whether you use their services or, say, nearby Dudley’s. Indeed, unlike private companies who advertise their products to passing motorists, they aren’t in direct competition with anyone. 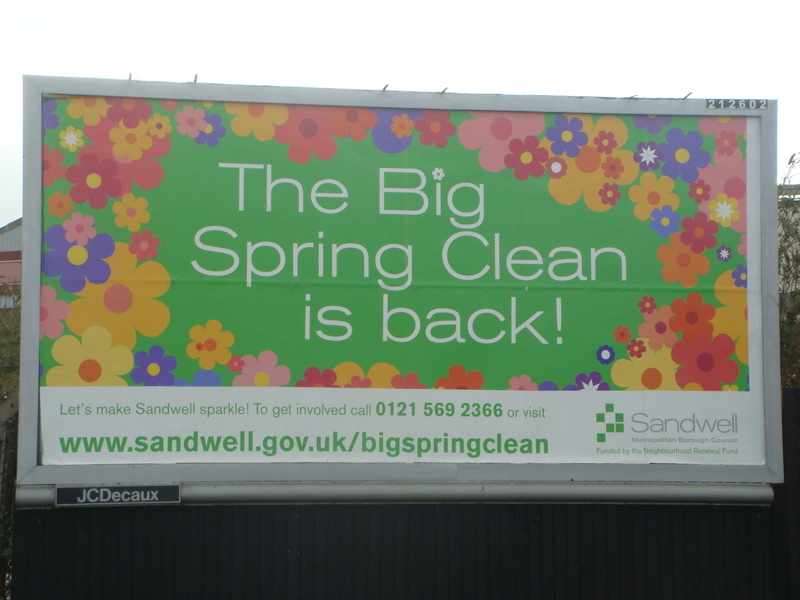 And what about flowery updates and stern warnings all proudly displaying the Sandwell Council website address? 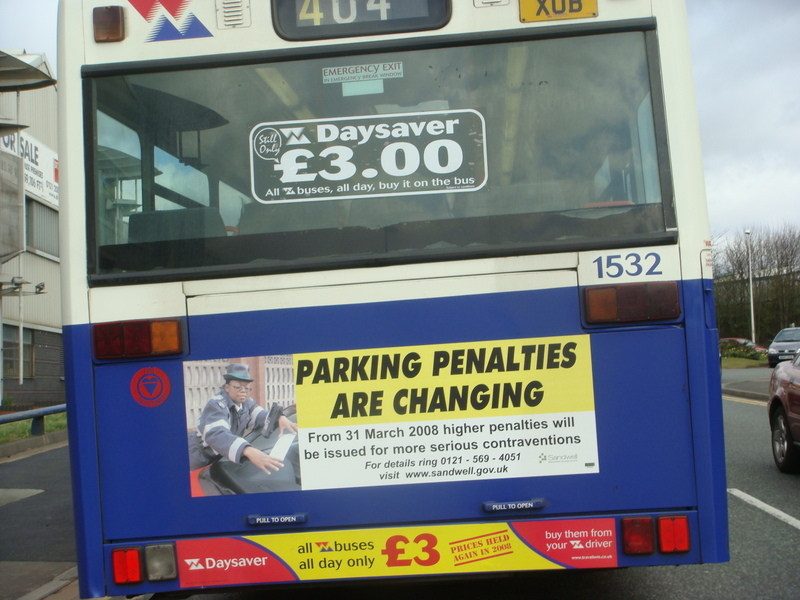 So what if car “Parking Penalties are Changing” for worse contraventions? You’ll soon find that out if you commit a pretty serious contravention – which you shouldn’t do. Surely if you’re going to have a poster it should just say “Don’t commit parking offences”, but of course that’s ridiculous. This just looks as though they’re warning residents that it’ll be a bit pricier to break restrictions in order to give them the opportunity to assess whether they can afford to! 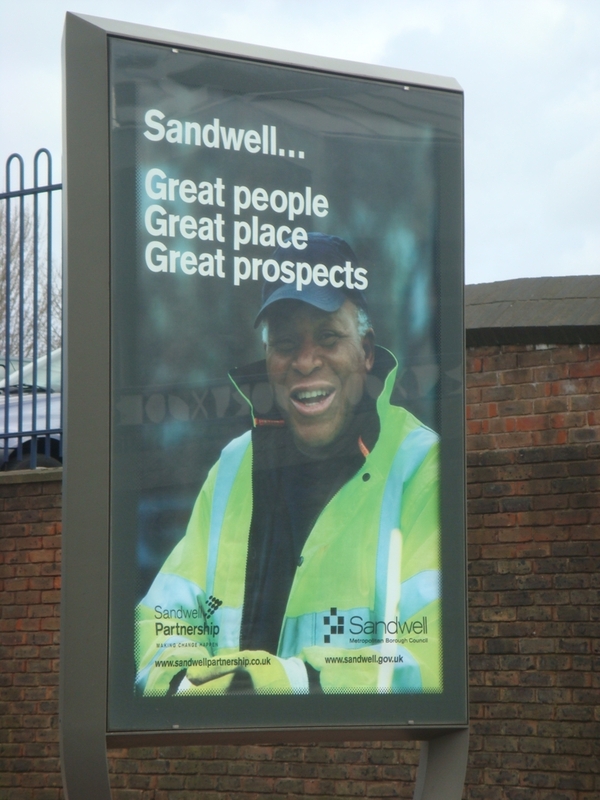 Perhaps the saddest thing about this fervent self-promotion, is the fact that Sandwell isn’t “great” at all. At the end of February I spent some time there with the specific purpose of asking local retailers and people on the streets what they thought of the area and council. I couldn’t possibly quote what I was told for the most part, but it’s fair to say that the people who live there do not think that it is all that great. In fact, they don’t even think it is adequate. It is one thing having a strong visual presence if you can afford to do it, and if what you are promoting is really worth the effort. But many parts of Sandwell are in need of real attention, and if I lived there I’d be resentful of the fact the place has been all but wrapped in expensive posters by the local authority whilst services aren’t up to scratch and locals are being called upon to stump up for another council tax rise. At the end of the day, if Sandwell Council have the money for all of these posters - not to mention the PR, adminstration, design costs and various logistics that accompany them - then they have money to give a tax cut because there’s little doubt that this is indicative of a council that will be leaking money needlessly in different directions. If Sandwell Council are really so image conscious and eager to impress those both inside and outside of their boundaries, then they should look to a Borough council like Hammersmith & Fulham in London, and learn that areas with good services and fair rates sell themselves.